Welcome to our interview with the Kingdom Herald, whose title is Silver Buccle Herald. This is the second in our series of interviews with Kingdom officers, to learn what they do. You can read the first, an interview with the Kingdom Historian, here. The Gazette wishes to thank Master Kameshima for his thoughtful and well-written answers to our questions! Kameshima Zentarō Umakai is a government official in 16th century Japan, serving in the Department of State and Ceremony. How did you become a herald? When Dame Elsbeth Anne Roth was Laurel Sovereign of Arms (the chief herald of the SCA), her staff mainly consisted of people from the Debatable Lands. She, along with Lady Juliana de Luna and Lady Richenda du Jardin, saw this as an excellent opportunity to train a new generation of heralds, and invited me to start attending her staff meetings. I fell in love with so-called “book heraldry” (the study of how names and coats of arms existed in period, and helping other SCAdians to design theirs) at those meetings. My interest in Court Heraldry stemmed from my love of theater, which goes back to when I was a child. Mistress Giulietta da Venezia, who was Comet Pursuivant of the Debatable Lands at the time, helped teach me all the things I needed to know to conduct Baronial and Royal Courts. Photo of Master Kameshima by Master Augusto Giuseppe da San Donato. What does the Kingdom Herald do? 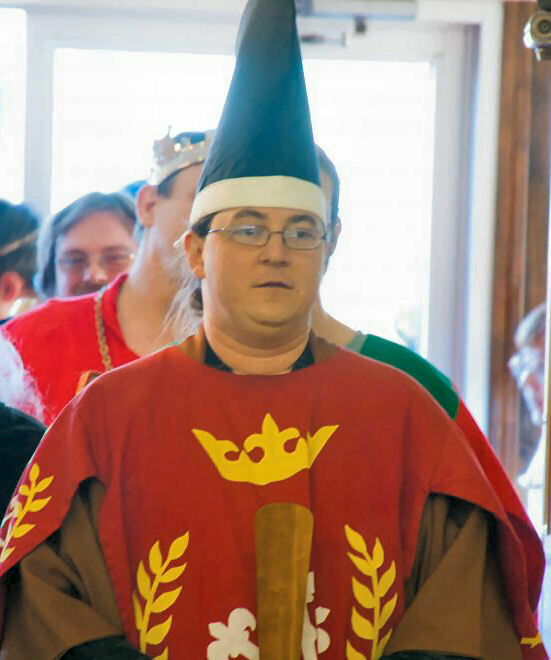 The Kingdom Herald is in charge of coordinating all the Heralds in the Kingdom (called the “College of Heralds”). This includes overseeing the process of name and armory submissions within the Kingdom, coordinating heralds to conduct Royal Courts, and making sure that martial tournaments such as Crown Tournament and the Queen’s Rapier Championship are called by heralds if they so desire. Each Kingdom’s College works a little differently. In Æthelmearc, at least for the last several years, the Kingdom Herald (who has the title of Silver Buccle Principal Herald in Æthelmearc) has had the responsibility of being the primary Court Herald, but that will be changing. Starting with Their Highnesses, each set of Royalty will have a primary Court Herald (who will have the title of “Jewel of Æthelmearc Herald”) as part of their Reign Staff. What kinds of heraldry are there in the SCA? Book Heraldry is the study of names and armory as they were used throughout SCA period. Heralds help people come up with the names and coats of arms that they use in the SCA. Court Heraldry is the practice of conducting Royal Court. That means a lot more than just reading scrolls out loud! 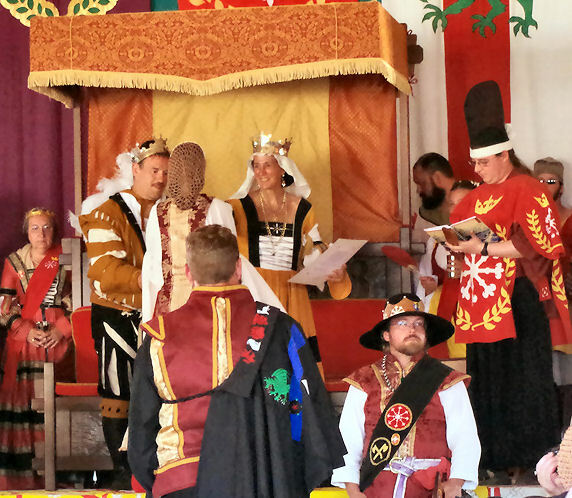 There’s a lot of protocol and ceremony that goes along with Royal Court, plus you need to work with the Royalty to make sure that Court remains interesting and doesn’t drag on too long. Tournament Heraldry is helping to “emcee” martial tournaments, which includes making sure that the fighters know when and in which “list” they’re going to be fighting, making sure the audience knows who’s fighting, and making sure that the traditions of the list are followed (like the conducting of “honors,” which are where the fighters pay honor to the Crown, to their inspirations, and so on). Who are your deputies, and what are their roles? I have a lot of deputies! And most of them have titles that, like mine, are named after awards here in Æthelmearc. There are Regional Deputies for each of the 5 Regions of the Kingdom who are in charge of keeping closer tabs on what’s going on with the local groups in their regions than I’m able to. Their titles are Millrind (Region 1), Gage (2), Scarlet Guard (3), White Horn (4) and Fleur d’Æthelmearc (5). I also have deputies who are in charge of various specific aspects of heraldry. Garnet and her deputy Cornelian are in charge of the submissions process (which I’ll explain in more detail below). Keystone is my Education deputy, and he organizes heraldic education classes for Heralds & Scribes Symposiums and Æthelmearc Æcademies, as well as local educational opportunities. Sycamore is in charge of Tournaments, organizing heralds to emcee Crown and other tournaments. Their deputy Seedling is in charge of the Crown Tournament Shield Trees, from which you’ve seen the combatants’ armory hanging at Crown. Golden Alce is the deputy for the Order of Precedence, which is the list of who has what awards and when they got them. Finally, the College of Heralds has a Silent Heraldry deputy, in charge of providing sign language interpretation during Courts, a College Webminister, and, because we maintain our own bank account, a College Exchequer. What is the College of Arms? How does it operate? The College of Arms is the collective name for all the heralds in the SCA! But you’re probably asking how the submission process works. When you submit a name or armory, first it gets sent to Garnet. Garnet puts it out on what’s called an “Internal Letter of Intent,” where heralds throughout Æthelmearc (and a few from other Kingdoms) get about a month to do extra research, make sure that the names and armory don’t “conflict” (they’re not too close to names and devices that are already registered), and so on. Then Garnet will decide whether it needs to be returned for more work, or whether it can get sent in an “External Letter of Intent” to the Laurel Queen at Arms and their deputies, the Pelican Herald (who makes name decisions) and the Wreath Herald (who makes armory decisions). Then heralds throughout the SCA get another chance to look at it, do more research, or anything else that is needed. Finally, Pelican and Wreath will make decisions on all the names and armory that were submitted in a given month from all around the SCA, whether it is returned, or registered for all time. A few months later, their decisions are published in a “Letter of Acceptances and Returns” (“LoAR”) which are posted on the LoAR page of the SCA heraldry website. The whole process takes about 9 months. I know that sounds like a long time, but the SCA is a big place, and we want to make sure we get it right! Do only Kingdom-level heralds get to do courts? Nope! While Silver Buccle does the majority of Courts (and the Jewel of Æthelmearc Herald will be taking over that job), that’s just so that the Royalty have a primary point of contact to develop a smooth working relationship. When I can’t make it to an event, I’ll ask one of the local heralds to conduct Court. And when I am at an event, usually I’ll have another herald assist me as a “Second Herald,” helping me to keep everything organized, read scrolls, and generally make Court interesting for the populace, and a special moment to remember for those getting recognized. Anyone who’s interested in giving Court a try should ask Silver Buccle or Jewel of Æthelmearc. We’ll work with you and train you so you know the things you’ll need to know. How else do you think you get good at this job? What kinds of things can people find on the Æthelmearc College of Heralds website? The College of Heralds website contains all sorts of heraldic resources, including submission forms, links to Internal and External Letters of Intent, the Order of Precedence, past Court Reports, and the Kingdom Roll of Arms, which contains pictures of all the names and coats of arms used by the Royalty, Groups and Populace of Æthelmearc. There’s also a Staff Roster of all the heralds in Æthelmearc. The site’s going to be going through a lot of updates and upgrades in the next few months, which started with the brand new Order of Precedence page put in place a few months ago. Stay tuned! What makes for good heraldic design? Good heraldic design, by and large, is simple. For most of period, coats of arms had one or two types of charges, and no more than two or three colors. Remember, not only did these need to be easily recognizable through a helmet while on horseback, but people needed to remember the heraldry of the people they were fighting with, so they knew who was trying to kill them and who wasn’t. Here in the SCA, because we have so many people who have armory, sometimes our armory gets a little more complex than what you saw in period, so that it doesn’t conflict with someone else. But simpler is always better. Heralds describe armory using a special language technique called blazoning. It’s a standardized way of describing the colors and charges of armory. A lot of people find it a little bit intimidating, but heralds love to teach people how to blazon heraldry! What are the best ways to choose an SCA name? Start by talking to a herald. There are few things that make heralds sadder than having to tell someone that the name they picked out of a fantasy book can’t be registered. You should, however, have some general idea of where you want to start. Some people choose a time and culture (“I want to be Italian, maybe 15th century; I love the clothing!”), and heralds can show you lists of names that were used in that time and place. Some people choose a name (“My grandmother was named Anna, so that’s what I want my name to be”), and heralds can do their best to find times and places that name, or something like it, was used. Other people have a certain meaning they like (“I want a last name that means ‘dark wolf’), and heralds can help you translate that into different languages and try to find names that get close to that meaning. My lady wife, Isabel, says the best advice she ever got about choosing a name in the SCA is “Make sure it’s something that you’ll answer to when you’re on fire.” Sound advice, but let’s hope we never have to test that out! Photo by Mistress Rowena ni Donnchadh. How can I become a herald? Just speak up. If your local group has a herald, talk to them and ask how you can help. If you want to learn book heraldry, Garnet holds her monthly decision meetings on Google Hangout, so if you have a Google account, you can get an invitation to sit in and listen. Not only will you learn a whole lot about name and armory research, but you’ll get an inside view on how the decision process is made. 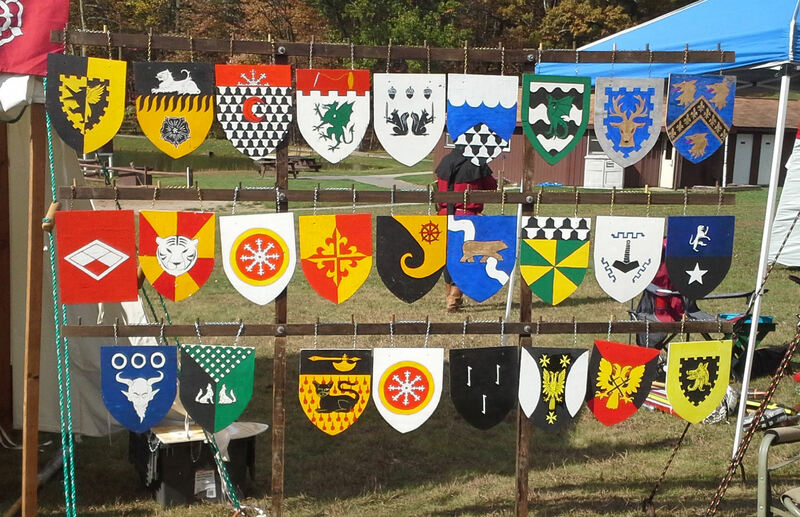 If you want to get involved in tournament heraldry, find a tournament that’s being heralded and ask to help. That includes Crown Tournament! If you want to give Court a shot, again, find Silver Buccle or Jewel of Æthelmearc and just ask. We LOVE getting new people involved in heraldry. If I’m not good at designing devices but I want to herald courts or tourneys, can I still be a herald? Or what if I like the device and name parts, but don’t want to do courts? Sure! Very few heralds do all three (much less do all three well). Some of the most famous heralds in the SCA have never heralded a Court or a tournament; others have never done any research into names or armory. It’s all about doing what you love, so find what you love and do it. Why did my submission bounce, and what can I do about it? If your submission gets returned for any reason, the most important thing to remember is that you have one year to resubmit without having to pay again. We’re not in this for the money, our job is to get people historically reasonable names and armory that they like. The most important thing to do is talk to a herald and show them the return letter that you got from Garnet. A lot of times, the reasons for return are written for heralds, and people who haven’t learned name or armory research might not understand what it means. Your local herald, or the herald that helped you with the original submission, can go over with you what went wrong, and what you can do to fix it and get it back into the process. My device submission bounced but I still want to use it anyway. Will I get in trouble? Well, there’s not really all that much “trouble” you can get into. As cool as I think it would be to be the “heraldry police,” we tend to err on the side of playing nicely with each other. So, that being said, that depends on why it got returned. 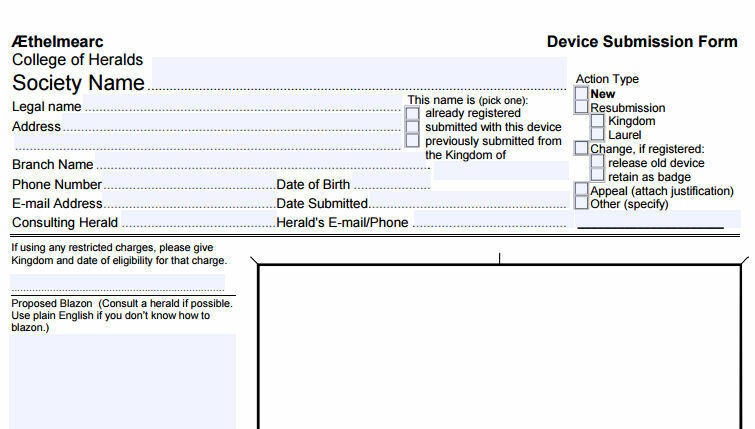 If it got returned because it can’t be registered, then at least you can be sure that nobody else is using it either. So yes, you can use it, and while heralds might look at it and try to teach you why it’s not registerable, nobody’s going to tell you that you can’t. If, on the other hand, it got returned because it was the same as, or too close to, someone else’s heraldry, then yes, that person does have the right to demand that you stop using that heraldry. You can refuse, of course — like I said, we’re not the heraldry police — but since the SCA is about promoting honor, courtesy and chivalry, that would be counter to the spirit of the game that we all play. When does your term end? How will your successor be chosen? The Principal Herald, like all Kingdom officers, serves a maximum of two two-year terms. I started my second term this past May, so my term will end in May 2017. Also like all Kingdom officers, my successor will be chosen by whoever will be King and Queen for the Summer 2017 reign. Where do you see heraldry in the SCA going? Are there any changes we should expect coming? I’ve already talked about the biggest change: the fact that Silver Buccle won’t be the primary Court Herald. As a result, I’ll have a lot more time to concentrate on two things that have always been very important to me as a herald: education and recruitment. The Regional Heralds will be working with local groups to encourage heraldic workshops, consultation tables, and other opportunities for more people to learn and practice heraldry. Heraldry — be it the use of names, the display of armory, or the pageantry of Court and tournaments — is one of the primary ways of making what we do in the SCA feel more “real.” Just as a fighter likes their kit to be authentic, or someone who makes garb wants to get the garment right, or a scribe wants their scroll to look like it came out of a medieval manuscript, we heralds love to see banners hanging in the hall, and we love to hear names ring loud and clear through the hall. More than anything, though, we love to teach others what we’ve learned and encourage people to love heraldry as much as we do. All photos not otherwise credited are by Mistress Arianna of Wynthrope.